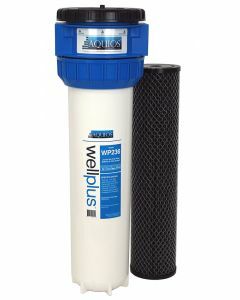 The Aquios® WellPlus™ Series of products is designed specifically for well water systems. Our salt free water softener and water filtration systems provide a high dirt load capacity and flow rates along with our salt free water conditioning technology that is effective for both calcium and iron. Well water typically has a slightly higher amount of silt, sediment and other material in the water. Salt free water softening systems do not demineralize your water. This means that the hard water minerals such as calcium and iron are still in the water. Our salt free water softener technology utilizes a process known as sequestering. Traditional water softerner system demineralize the water (removing the heathy minerals) and replace them with either salt or potassium. Our salt free water softener technology utilizes a process know as sequestering that prevents calcium and iron minerals from being able to bind together and create scale. The Aquios® salt free water softnener will prevent and reduce limescale while also filtering your water.